Brown the sausage, drain on paper towel and drain the grease from the pan. Add heavy cream to the same pan, along with the sausage, Worcestershire, salt and pepper and bring to a boil over medium high heat. Continue to boil stirring often for 5-7 minutes until reduced slightly and thickened. Serve over Low Carb Buttery Biscuits! How many servings would this be? About 4 half cup servings. Wow, I made this for breakfast this morning. 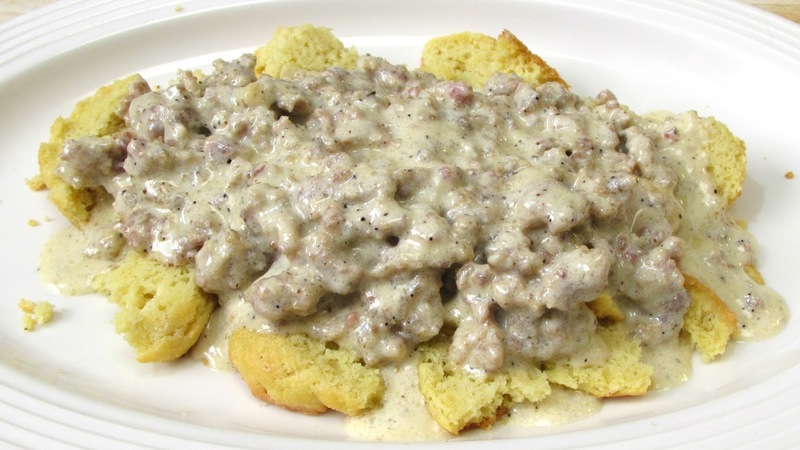 I have to say, they are not "quite" like Southern Biscuits and Gravy but if I had the choice of NONE or THIS, This would win, hands down. Trying to live while having Diabetes and not eating all the foods I love has been impossible. However, the Keto lifestyle is really becoming simpler and more convenient, thanks to recipes like yours. This is amazingly good. After the first bite Santa said, "I don't care for the biscuits." When he had cleaned his plate I questioned him and he said, "I changed my mind. This is really good. Make it any time...or, better yet, give me the recipe and I will make YOU breakfast next time." I couldn't agree more....it's not the 'real deal' but.....when you can't have the real deal it's really good! !Thanks Mr. & Mrs. Claus!!! 2 cups is 32 tbsp so that is 32 carbs , even if you divide per 4 servings is 8 carbs a serving. Some manufacturers round up even when it's not required. Anything at .5 gram or higher is considered 1 g. Heavy cream has I think .47 grams of carbs per TBS or 7 per cup. Which comes out to be 3.5 carbs per serving. Glad you liked it! I'm so happy I came across your video. I too was baffled at the thought of making graveyard with cream cheese and xanthum gum. The only question u have is my local store only has heavy whipping cream. Would that be the same as heavy cream? I have never bought an heavy cream before so it is a new item for me. Thanks again for this recipe.